Norm Grabowski,'23 T roadster. 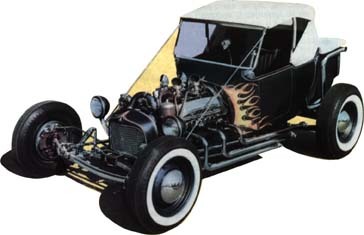 Although it was by no means the first fenderless, bobtailed, T roadster hot rad, Norm's was the first to combine the unlikely elements-including the drastically-shortened pickup bed-that led to'glass bodies and "Fad T's." First appearing in black paint with single-collector headers and a 3-71 blower on the October '55 Hot Rod cover, it was unquestionably the wildest thing on wheels in blue paint, Dean Jeffries flames, red upholsteryA and engine accents, many pipes, wild rake, suicide front end, and bleeding skull shift knob as seen on a Life Magazine full page in '57, and every Friday night from '58 to '60 as Kookie's car on the "77 Sunset Strip" TV show. It was then sold to "Golden Sahara" owner Jim Skonzakis of Dayton, Ohio, who modified it extensively and put it on the show circuit for a few years and reportedly still has it. Ed. note ; I first so this car in Clearwater, FL aroung 1961 with the Golden Sahara at a local Ford dealer. Jim Skonkakes took these two cars all over the country to Ford dealers, and I saw the car again in Anniston AL in 1962 qhilw I was in the Army. I understand that Skopnkakes still has both car and wouldn't it be something to see them again, even if they weren't in the best of shape.